The South Bergenite has posted a neat slide show of images, including a black skimmer at DeKorte Park, taken this summer by an NJMC staffer. 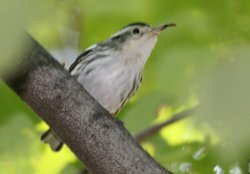 A lot of warblers are heading south again, and Schmidt’s Woods in Secaucus is a good place to see them. Last week, just beyond the park’s parking lot, we saw a black-and-white warbler (below) and a redstart high in a tree (right). 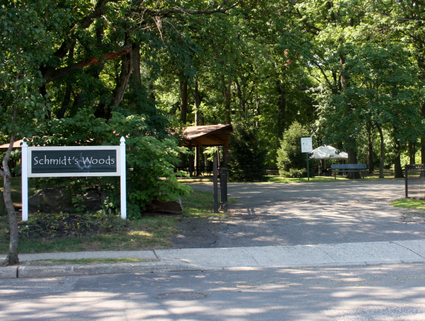 The park is on the small side, but the woods provide a great rest stop for the warblers. The trails are nice and wide, with an exercise circuit along the way. In years past, yellow-crowned night herons, a threatened species, have nested there. All in all, a nice oasis for birds and humans alike. 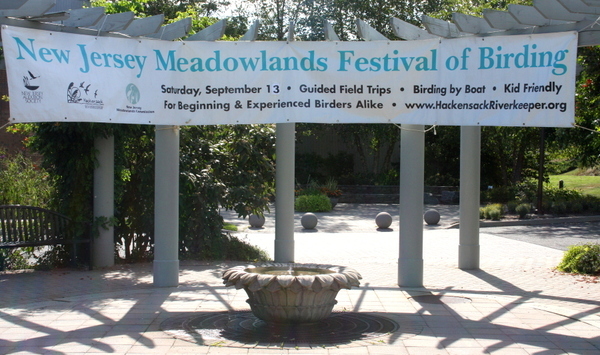 The Meadowlands Commission is adding another weapon in its battle to increase biodiversity in the 30.4-square-mile district. 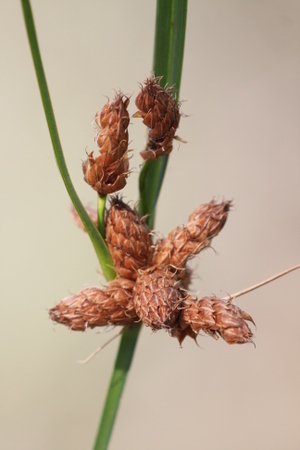 This week, Commission naturalists reintroduced saltmarsh bulrush, a valuable wetlands plant, at several sites in the Meadowlands. 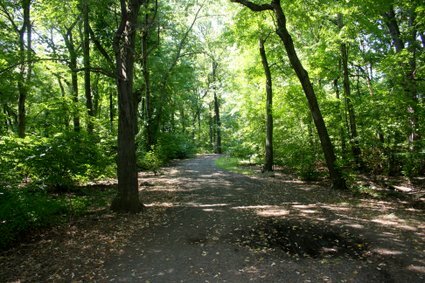 The sites included the the Mill Creek Marsh in Secaucus and Harrier Meadow in North Arlington, with more sites planned down the road. Click "Continue reading …" for more information and photos. Don Torino had a "real nice Peregrine Falcon on the power line tower across from the veterans memorial [in North Arlington]. It kept circling and calling, pretty cool." "I got the 3 Marbled Godwits around 2:45pm Tuesday at DeKorte. "A White-rumped Sandpiper (speckled along the flanks, longer wings) along the Marsh Discovery Trail. 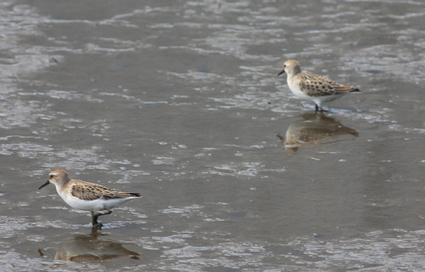 "Three Western Sandpipers mixed in with the Semipalmated sandpipers around the Marsh Discovery Trail. 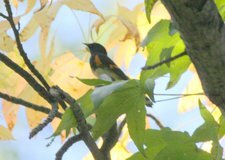 "A magnolia warbler and an american redstart along the Lyndhurst Nature Reserve trail. "One short-billed dowitcher hanging out with a group of yellowlegs in the phragmites cluster by the nature center. For non-birds, I got a hummingbird moth and a likely hairstreak butterfly (<link to Ray's photo here) at the Butterfly Garden. 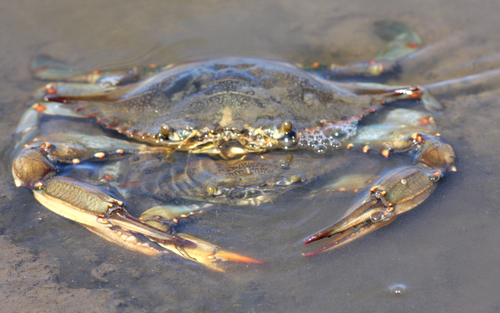 These crabs were seen in Saw Mill Creek Wildlife Management Area, by the Saw Mill Creek Trail, earlier this week. Woodcreeper.com, which tracks bird migration in New Jersey "using Doppler radar and a community of diehard birdwatchers," has proclaimed that the fall migration in on. Birder Mike Britt, a friend of this blog, today reported the immature white ibis, three marbled godwits, two Caspian terns and 10 kestrels in the DeKorte Park area of Lyndhurst. Click "Continue reading … " for his report to Jersey Birds e-mail list. 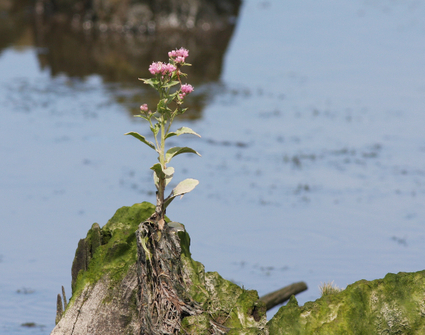 We’ve noticed this plant starting to bloom in a few places in the Meadowlands — such as Secaucus High School Marsh and the Marsh Discovery Trail in Lyndhurst. 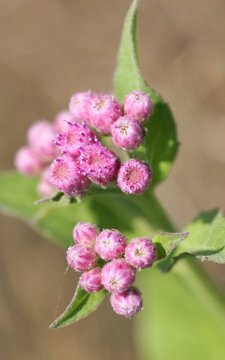 We asked one of our experts at the Meadowlands Commission, Dr. Ross Feltes, and he identified it as saltmarsh fleabane — a.k.a. sweetscent or Pluchea odorata. Feltes, a naturalist, reports that "it commonly colonizes disturbed brackish wetlands." He adds: "In past years it has grown on top of the cedar stumps in the impoundments at Mill Creek Marsh, making for an unusual, but pretty, feature." We saw it there this week (below). New Jersey Audubon’s Pete Bacinski and Scott Barnes had a nice column in the Star-Ledger on Saturday that highlighted birding along the Meadowlands’ mud flats. Read it here.